Newsreels of Ju 87 Stuka dive-bombers peeling off to begin their near vertical attacks are some of the most familiar images of the war. 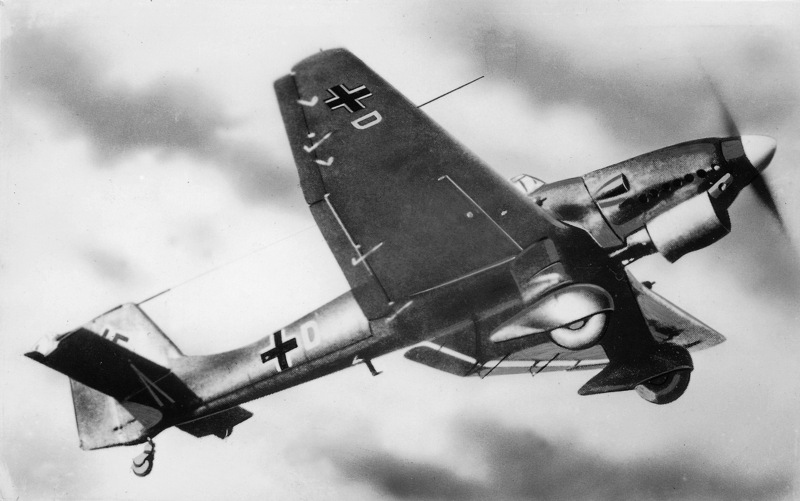 The Ju 87 was planned as a Stuka (short for Sturzkampfluzeug, or “dive-bomber”) a name that became synonymous with the type, to provide ‘flying artillery’ to support the armoured forces that would spearhead Germany’s Blitzkrieg (lightning war) tactics, and is forever associated with the success of that strategy early in the war. The aircraft first flew in 1935 with twin vertical tail surfaces and a British Rolls-Royce (RR) Kestrel engine, but was then developed into the Ju 87A initial production model (200 aircraft) with a single vertical surface, the 507kW (680hp) Junkers Jumo 210 inverted-Vee engine, trousered landing gear (to improve the aerodynamic efficiency of the no-retracting undercarriage) and a crutch to swing the bomb away from the fuselage before release. The Ju 87A entered service in spring 1937 but was soon supplanted by the Ju 87B-1, which had a much uprated powerplant. In Poland the Stuka proved devastating; less than a year later its vulnerability was exposed over southern England. Many sub-variants were produced until 1944; from 1942 to 1945 its main work was close-support and attacking armour on the Eastern Front, although it was also used as a transport and glider tug.